A web-based online survey platform that helps small businesses, academics, HR & Marketing organizations, communities and individuals to build personalized surveys in order to help them in making better business decisions. 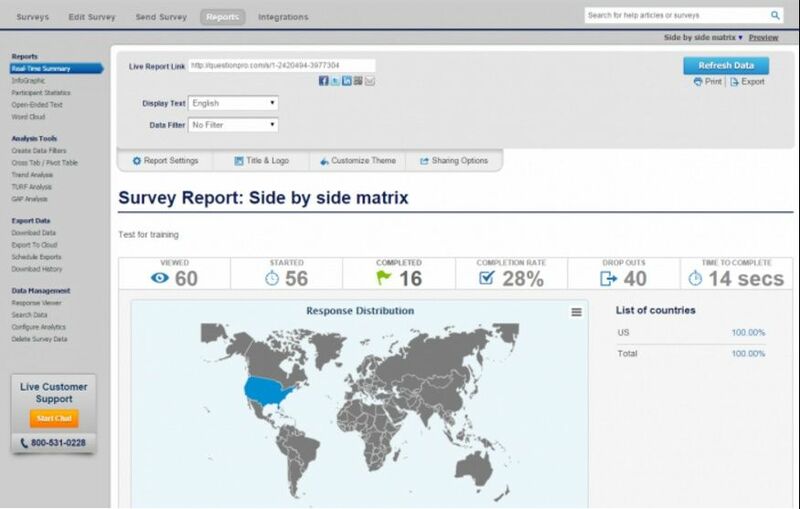 Its intuitive tools let you easily create surveys, distribute and analyze reports based on the collected feedbacks. Besides, it also includes polls, web forms, quizzes, data visualizations, in-built templates and a range of question banks that ensure deep-rooted survey. The survey invitations can be sent to respondents via email, pop-ups and social media platforms including Facebook and Twitter. The feedbacks can also be collected via tablets, Android & iOS smartphones. How much does QuestionPro cost ? 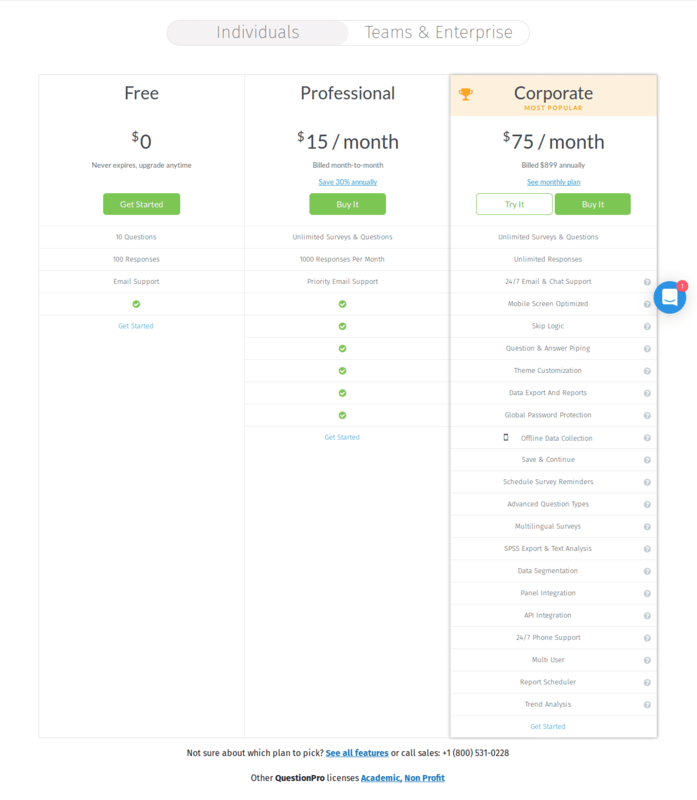 The pricing for QuestionPro starts at $15.0 per month. QuestionPro has 2 different plans such as - Individuals Professional at $15.0 per month and Individuals Corporate at $75.0 per month. 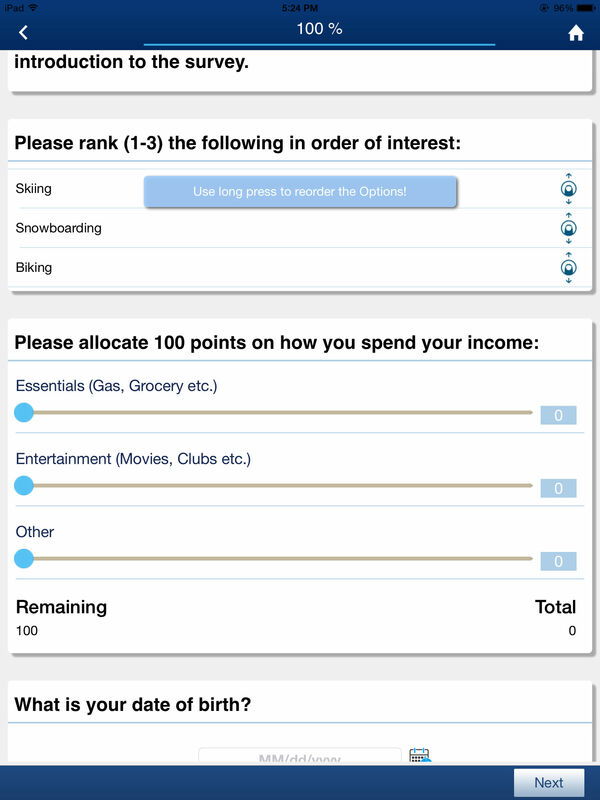 QuestionPro offers a Free Plan with limited features. They also offer an Enterprise Plan for their product. "All the features you're likely to need at a reasonable price." It has a wonderful combination of power plus ease-of-use. Of course many others in this category do too! The main thing that differentiates QuestionPro from similar competitors like Qualtrics and SurveyGizmo is the superb customer service. Our team has managed software contracts with 30 vendors for 36 years, and the QuestionPro team has been the most responsive we've dealt with. With most companies, when you tell them about a feature you'd like to see added, they'll thank you and add it to a list. If you're lucky, you might see the result in a future release a year or two down the road. 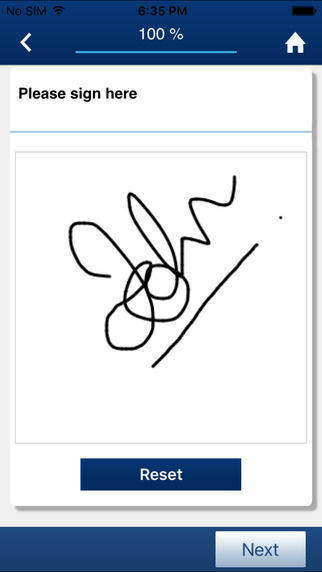 With QuestionPro, we've gotten features added in just a few weeks. Plus unlike other vendors (e.g. Qualtrics), all their features are included in the price and even new ones we request are added for free. Their login could be faster. For example, it can occasionally take as long as a minute to log into the design part of the system. Their competitors can do that in less than half the time. We would also like to be able to collaborate with people at other organizations (e.g. multiple people with edit authority). For the time being, collaboration is limited to inside an organization. Expanding that is high on their to-do list, so I hope we see that soon. Compare it feature-by-feature to far more expensive products such as Qualtrics and I think you'll be pleasantly surprised. 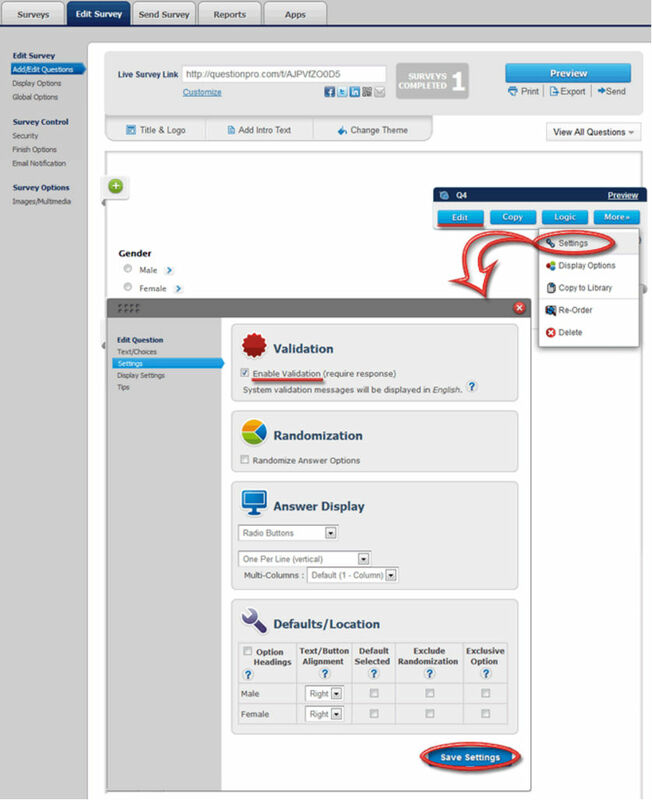 If you're migrating from Qualtrics, they can import the surveys and data from there fairly automatically. As a major research university, we're launching around 1,200 surveys per month in every imaginable category. Pros: QuestionPro is a great survey tool that offers a lot to the users. What I love about it is that it offers several question types to choose from. This is something that most of the other tools don't offer. Yes, it is free. However, you'd need to switch to a paid plan if you wish to get access to more features. The paid plan is very affordable. Cons: Though it is updated very often but there are still several features that are missing such as customization options and non-text surveys. Overall: Definitely recommended if you're interested in understanding your audience. Pros: I used this platform to complete my dissertation research. It was easy to recreate an assessment in this technology and send it out to potential research participants. Cons: This software company nearly deleted my dissertation data on more than one occasion while I was still working even though I was promised a free education account. Customer Service was difficult to deal with and much unnecessary stress was caused because of their miscommunication and unkept promises. Overall: While an organized platform, I would utilize a different option in the future because of the stress and frustration caused. Pros: Very user friendly for implementing the "coding" part -- I do not work on the Tech team, and I was able to get everyone on my staff set up with a link to a survey with little help. Cons: More customization would be nice, especially on how the links look for customers such as fonts or more graphics to help make it fit our company and our customers. Pros: The platform provides good features but not much different from other platforms. It is also very easy to use. It is Good for fun but not for critical or serious research. "Cost effective but did not meet our needs"
Cost efficient, cheaper than SurveyMonkey and Qualtrics. Customer support is slow but very nice and easy to work with. The support team is very slow to respond - the people that I worked with were located overseas and it would take 7-10 hours to get a response (and it would be overnight). Overall it wasn't efficient to work with this company for this reason. 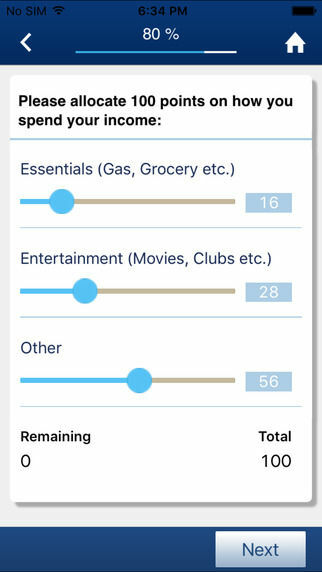 The survey builder is pretty nice and has a lot of features. I would not recommend QuestionPro for building out a user panel. We were trying to get surveys sent out and build a panel through QuestionPro. Our engagement rate was low through QuestionPro - the users we recruited through QuestionPro did not like the format. Qpro has awesome functionality and easy to understand raw data formatting. Their support team is also quite competent (although they try to upsell you constantly). Without html coding, the respondent-facing interface is ugly. Survey monkey is much easier to make look at least somewhat pleasant. 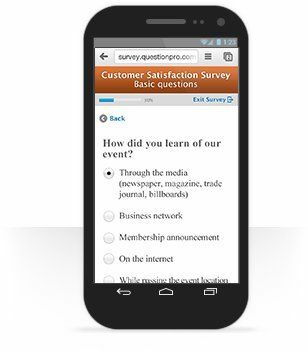 Our teams launched tons of consumer surveys with qpro. we worked with 3rd party panels to gather 10s of thousands of responses. You can trust this product. As long as the operator knows the basics of writing a good survey, this program will give you infallable analytics and everything is easy to manage. Mistakes are easy to make if you’re a beginner. A very helpful UX tool would offer up survey design tips that help users collect better data. This is what you’ve been looking for. Talk to their customer service about anything. They are very helpful. As a branding agency we do quantitative research to gain information about our customers, their preferences, and behaviors. This has allowed us to take our research in-house. It is so easy to use, it’s a surprise that we ever paid a vendor to do the research for us. 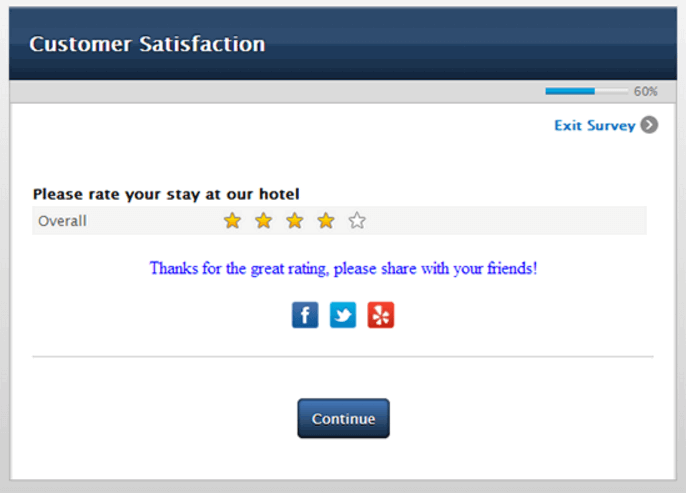 Pros: I liked the most that QuestionPro is easy to use comparing with others, also it is user friendly product. You can prepare your questions and make effective online surveys with reliable and honest results. I like using this software. Cons: it has been 7 months that I am using this software, till now I did not have any problem it is really easy to use and safe software. Overall: I can recommend for companies making online surveys. Results are great and satisfactory.